The thighbone (femur) is your longest and strongest bone – so durable that a thigh fracture it is typically the result of an extreme impact because it usually takes a tremendous amount of force to fracture it. Causes may include falling from a dangerous height, receiving a gunshot wound or being involved in a car or motorcycle accident. 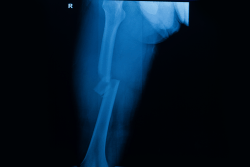 The severity of the fracture differs significantly depending upon the accident. Did the skin and muscle above the bone get torn by the injury? Transverse fracture. A break in a straight horizontal line going across the femoral shaft. Oblique fracture. A fracture in an angled line across the shaft. Spiral fracture. A twisting force to the thigh causes the fracture line to encircle the shaft like the stripes on a candy cane. Comminuted fracture. When the bone is broken into three or more pieces. 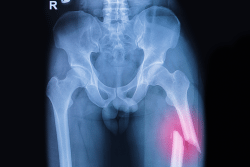 The number of bone fragments usually corresponds with the amount of force required to break the bone. Open fracture. An open (or compound) fracture is when the bone fragments stick out through the skin, or a wound penetrates down to the broken bone. Open fractures often involved much more damage to the surrounding muscles, tendons, and ligaments. Open fractures have a higher risk for complications, greater risk of infections, and take longer to heal. Florida Orthopaedic Institute boasts a team of highly-skilled and fellowship trained surgeons to care for femoral (thigh) fractures, regardless of the injury’s extent. Our doctors will confer with you regarding the cause of the accident, the extent and areas of your pain, your medical history and any current medical conditions that should take into consideration (e.g. allergies, diabetes, blood pressure, asthma, etc.). The doctor then performs a complete examination with an emphasis on your thigh injury. As necessary for a precise diagnosis of the damage, the doctor may order tests, such as an x-ray or a CT scan. Most thigh fractures require surgery to heal properly and it’s unusual for them to be treated without surgery. Very young children are sometimes treated with a cast and not surgery. If the skin is not ruptured, the doctor may postpone the surgery until you are in a more stable condition depending on any other injuries and conditions. In the meantime, the affected leg is placed in a splint or traction device. If the skin is torn, surgery is performed immediately since the risk of infection is a serious concern. There are various methods of surgery that will be considered based on your injury and conditions. Recovery typically occurs within 4 to 6 months. Your doctor will encourage movement of the leg during your recovery and prescribe physical therapy once recovered. 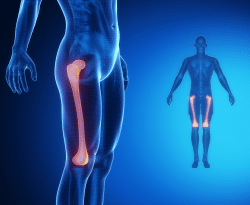 As with any surgery, the talented team of Florida Orthopaedic Institute’s surgeons who specialize in this area will have a detailed discussion with you and encourage your questions.